Have you eaten this combination of pizza before? Have you seen this on a menu in a restaurant you have been to? A few weeks ago, I have posted a photo of my newly created pizza on fb. Newly created because I have made the pizza toppings out of what I had in the fridge. I have forgotten to write about it until I was scrolling down my facebook timeline and saw the photo. It was good that every time I cooked a new recipe out of scratch, I took a note of what ingredients I used and of course taken photos as well. 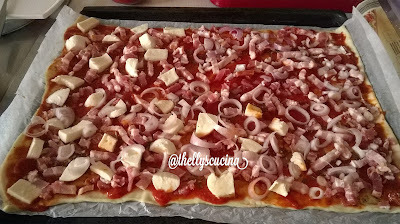 I used a ready-made pizza dough this time, which I bought from a supermarket but I usually make my own dough. 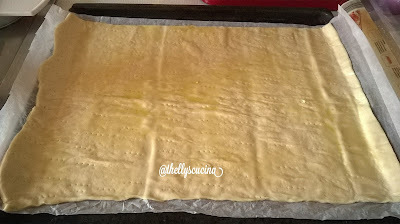 You can see the dough recipe here on my HubPages article if you don´t have a ready-made dough. #1. A ready-made dough from a supermarket. #2. Sauce arrabbiata with dried herbs on the dough. The ready-made dough is rolled in a paper inside the packaging. Put this dough in a baking tray together with that paper. 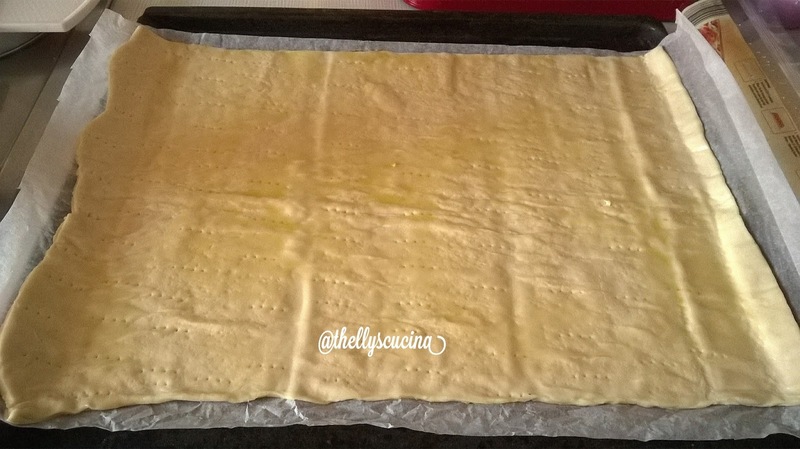 Roll the dough out of the paper and see to it that the whole baking tray is covered by it. Then poke holes on the dough by using a fork. 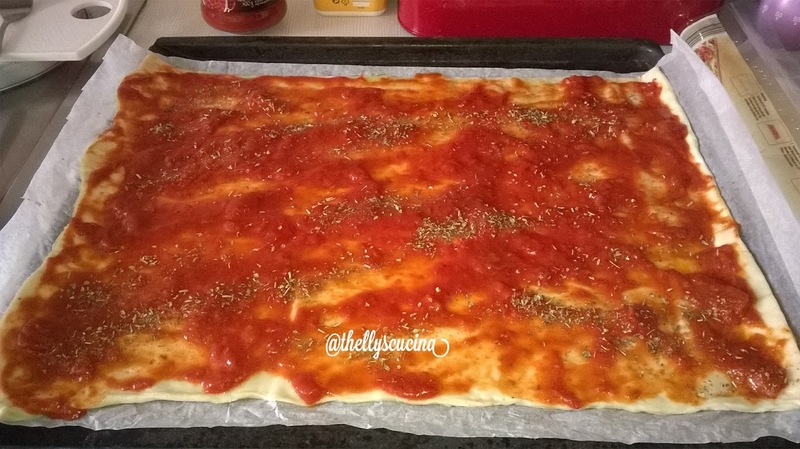 Spread the pasta sauce arrabbiata on the dough. Add the dried pizza herbs on top. 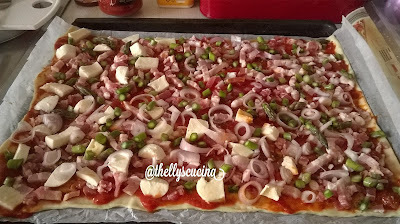 Then add alternately the bacon slices, the onions, the mozzarella and the asparagus slices on top of the dough. 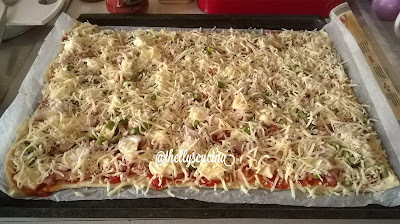 Cover the toppings with grated cheese. Bake in the preheated 220°C oven for about 20 minutes. 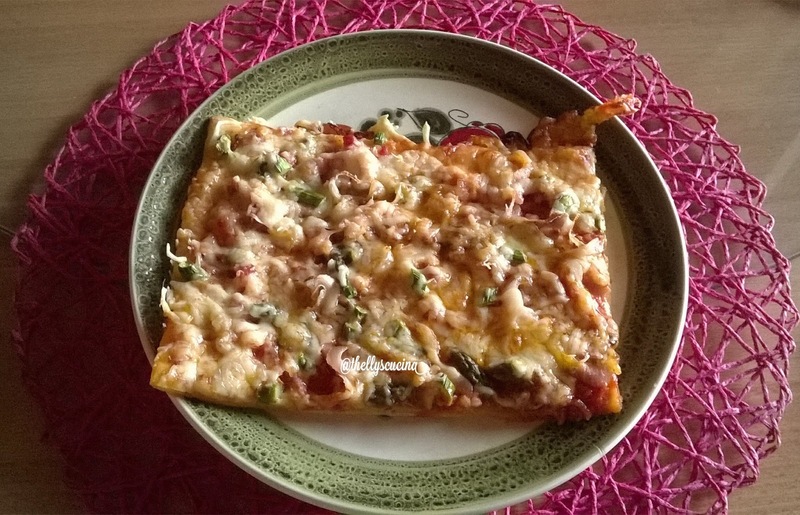 Serve with vegetable salad. Enjoy! #3. 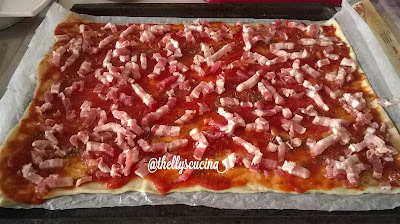 Bacon added to the Sauce arrabbiata with dried herbs. Onions added and Mozzarella on top. Green young asparagus added on the toppings. #4. The grated cheese added on top. BTW, I have only put mozzarella on half of the pizza topping as one of us in the family doesn´t like mozzarella. So you can double the amount of mozzarella if you want. Note: Every oven is different, so check the pizza after 15 minutes of baking. It is good when the cheese has melted and the pizza looks golden brown. 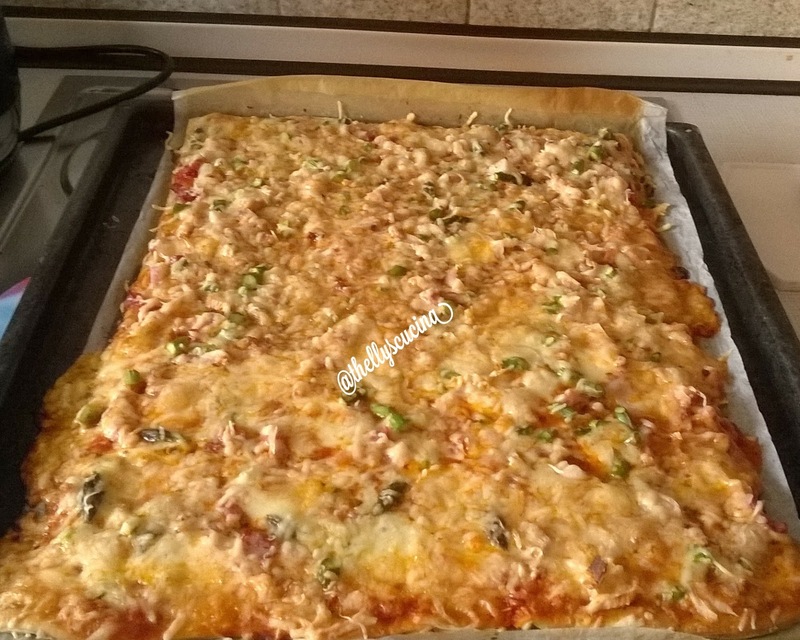 I hope I have inspired you to make your own pizza at home. 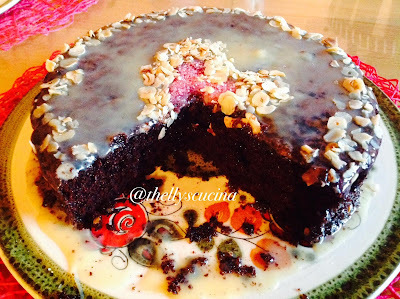 If you want to see more of my recipes, just check my main writing site HubPages and of course my @thellycucinainternational site at Blogspot. Thank you very much for dropping by. Please feel free to share this blog on any social media site that you have. Have a great day wherever you are. This looks awesome. Can I have a big slice please..
OMG. How can you go wrong with BACON?? 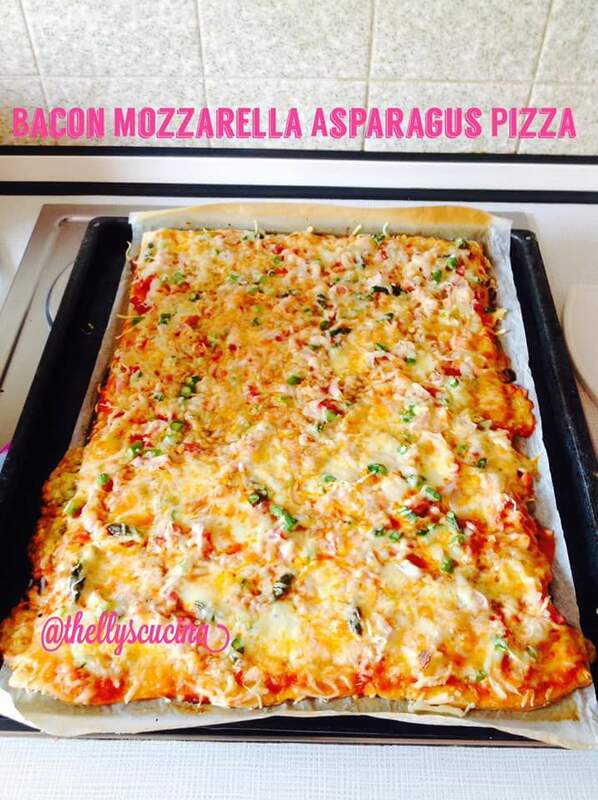 I've have never thought of asparagus on pizza, I am definitely going to have try this. Thanks for the idea, Thelma! With bacon, it will not go wrong whatever food we cook Snuffy. I have never thought adding asparagus in my pizza until I saw my asparagus in the fridge waiting for me to be cooked. It was yummy indeed. Thanks for your nice comment. Thank you very much The Savvy Age. Enjoy your weekend!